ALLEGRA BOVERMAN/Staff photo. Gloucester Daily Times. Gloucester: During a daylong visit to East Gloucester Elementary school by Gloucester High School Honors Physics and Physics of Robotics classes students on Friday. 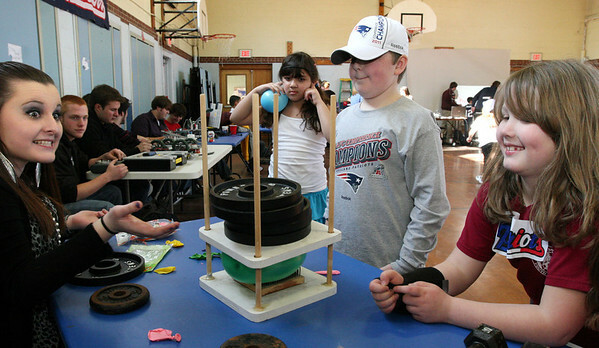 Danielle Pomeroy, far left, a GHS junior, talks with second graders Deven Lichtenwald, far right, and Ethan Williams, second from right, about how many pounds of weight might still be needed in order to pop the balloon underneath them that is balanced atop nails. In the background, center, holding her ears for the inevitable but unpredictable balloon pop, is second grader Lidia Quintanilha. Pomeroy, and classmate Aimee Sullivan also a junior, not shown, were able to put 35 pounds of weights atop the balloon before it popped under the pressure. They were teaching kids about force and pressure.